Common Name: Scutellaria root, Scute, Skullcap, Baical skullcap root. Radix Scutellariae is produced chiefly in the provinces of Hebei, Shanxi, Inner Mongolia, and Henan. The root is collected in spring or autumn, then dried in sunlight and sliced. It is used unprepared, stir-baked with wine, or stir-baked until it is charred. Meridians: Lung, gall bladder, stomach and large intestine. Functions: 1. To clear heat and dry dampness; 2. To reduce fire and release toxins; 3. To stop bleeding and calm fetus. 1. Damp-heat syndromes: a) damp-heat febrile diseaseScutellaria root (Huangqin) is used with Talc (Huashi) and Rice paper pith (Tongcao); b) jaundiceScutellaria root (Huangqin) is used with Capejasmine (Zhizi), Oriental wormwood (Yinchenhao) and Bamboo leaf (Zhuye); c) dysentery or diarrhea Scutellaria root (Huangqin) is used with Coptis root (Huanglian); d) boils, carbuncles and furunclesScutellaria root (Huangqin) is used with Honeysuckle flower (Jinyinhua) and Trichosanthes root (Tianhuafen). 2. Cough due to heat in the lungs. Scutellaria root (Huangqin) is used with Mulberry bark (Sangbaipi) and Anemarrhena rhizome (Zhimu). 3. Threatened abortion (restless fetus). Scutellaria root (Huangqin) is used with Chinese angelica root (Danggui) and White atractylodes (Baizhu). 4. Hemorrhage due to heat in the blood manifested as vomiting with blood, epistaxis, hematuria and uterine bleeding. The carbonized Scutellaria root (Huangqin) is prepared and used with Fresh rehmannia root (Shengdihuang), Imperata rhizome (Baimaogen) and Biota tops (Cebaiye). 5. For Heat syndrome during pregnancy and threatened abortion, it is used with Radix Angelicae Sinensis (Dang Gui) and Rhizoma Atractylodis Macrocephalae (Bai Zhu) in “Radix Angelicae Sinensis Powder” (Dang Gui San). Dosage: 3-10 g, decocted in water for an oral dose, or prepared into a bolus or powder. For clearing away Heat, it should be used unprepared; for preventing abortion, it is usually stir-baked; for hemostasis, it is stir-baked until charred. 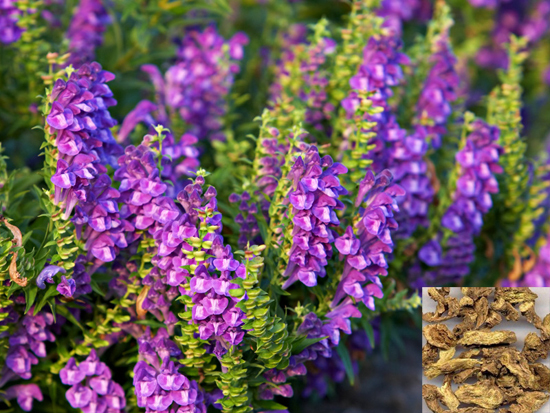 Cautions & Contraindications: This herb is contraindicated in cases with deficiency cold of the spleen and stomach. The raw herb is used to calm the fetus by clearing heat, the herb stir-baked in wine is used to stop bleeding, and the carbonized herb clears heat in the upper jiao.